It's summer, I'd rather be sailing, an enthusiasm of mine since my parents shipped me down to Mrs. Gardiner at National Yacht Club for the junior sailing program. We learned sailing from the keel on up, starting with the basics of sanding a battered Nordberg hull (the victim of the previous year's neophytes). Before that I remember fashioning boats from bits of 2 by 4, some doweling and cloth and floating them in puddles in a neighbour's driveway. Related work led to the foundation of the Canadian KubKar School of Design. My own poor choice of building materials for racing yachts culminated in what became a family joke. Using the Nordberg for inspiration, I fashioned a sturdy craft from tongue and groove barnboard (recycling it well before this became a designer trend). Unfortunately my craft sank straight as an Arrow to the bottom on launching at Cold Creek Farm. No one has bothered to look for it. Salvage rights are not in dispute. This young fellow looks much happier than I was that day. And what should we trip over? No. Not the same boat but one someone else had really tripped over earlier that morning. Quite a nice, if somewhat clunky maritimer, now sitting dismasted and entangled on the floor. After a bit of haggling home she goes --what's another project? And I set about the pinning and splinting of main and mizzen and the disentangling of miniature blocks and twisted wire fittings. After only a couple of mis-steps (rigging the mast to discover that the mainsail rings should have gone on first), she came back together. Nice lines, if a little dowdy, and by those cavernous holds an East Coast freighter or fishing smack. Not a bad job I thought and then the age-old question, will it float? I didn't get too many strange looks as I traipsed through the valley of the mighty Don with boat and camera looking for a launch site. I hadn't wanted to try Lake Ontario lest the winds take her to Rochester or the water impart a glow to the hull. A successful launch. Well actually a bit of a fake, but an honest pre-digital fake. This boat needs more ballast to remain upright. I'd have about 20 seconds to get the picture before the list became critical. So there she is gunkholing along the Don River somewhere south of Leaside. Value? I hear someone asking. It's hard to say. I know that's a standard dealer response but these types of boats float in a collectors' Bermuda Triangle. They're not really toys and few are genuine antiques. Without a reasonable provenance, how could you tell an age given similar construction methods and materials? With a provenance (owned by a good friend to the court of King Zog), a known carver (I don't know if Bill Reid did any toy canoes), a famed namesake (although there are so many models of the Bluenose around, good and bad), higher grade fittings ( a bit of shiny brass here and there), or a sailing history and maybe even a trophy or two ( Scourge of High Park Pond 1926 ), the price can escalate. As with any toy, the monetary value is simply a number temporarily attached to a transfer of ownership. Ask any sailor. Beauty is in the eye of the beholder and in the imagination of the crafter and the owner of these summertime pleasures. There I was worried about meaningful content and stimulating information for you Antiques and Collectibles traders and for any of the general public. Wracking my brains and archives for the usual stimulating Trove of the Arcane (a Harrison Ford epic coming soon to a theatre near you). Then, when reading the weekend magazine of one of Canada's newer national papers, I chanced upon 1000 words and a full colour picture on the club sandwich. Boy, did that relieve the intellectual pressure on this month's article! And while I'm at it, who was the bright spark looking to antagonize ALL of Canada west of the Humber with the slogan stressing that , after all, Toronto's local news WAS national news!!!!! I think I'd rather be sailing, again. It's been a year since my adventures getting the folk art fishing boat to sail the Don River (and the inflammations have almost healed). And history repeat itself as Valerie and I are at the St. Lawrence market again buying a toy sailboat that needs some work - mostly spars and rigging. She's a lovely hull in what looks to be in original condition. (The boat you idiot). There's no maker's plate and I have no idea whether it's mass production or a one off -- but she's a beauty and looks like she will sail without any problem. The Don is deeper this year. Quieter I don't know about. 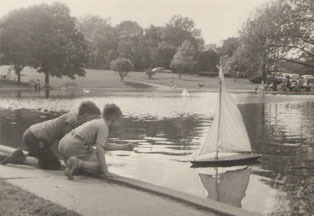 Which brings us to building and racing and now collecting Pond Sailers (my spell check is flagging this so maybe it is sailors--but wouldn't that refer to the men not the ships?). 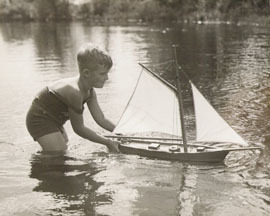 Building these model yachts was/is obviously an art and a skill. Starting with a scale drawing or an assemblage of wooden blocks and turning out a sleek hull, a competitive hull. 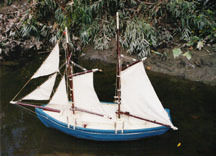 As a teenager, I tried building one of the excellent Billings kits of a Dragon, an Olympic class sloop much favoured by royalty in the 50s and 60s. I can recall pictures of Philip and other members of the Greek royals racing them. The kit should have been easier to build than any scratch built model, since all the parts were supplied pre-cut. Except for the planking which had to be laboriously built up with pins and glue for the hull and deck. That was the rub, and I'm not referring to the endless coats of varnish I applied to get it to the right lustre. The planking ended up ever so slightly asymetrical, there was a deck plank more on the starboard side than the other and try as I might, I couldn't fix, or disguise this less than perfect aspect of my model. So it was left unfinished in the top of a cupboard, not the first time (for any of us I'm sure) that painstaking labour and concentration would produce less than optimal results, just look at these articles. The period from the 1890s to WW2 was a golden age of pond racing yachts. Inspired by the real J Boats, Sir Thomas Lipton and his five Shamrocks, the best of the pond sailers reflect those hull shapes and sail patterns,the sort of yacht you see advertised or for sale today in retro hardware stores, beautiful but disappointing in that they don't actually sail. Where are his yachts now? We don't know who actually made this yacht. It carries a brass plate from Gamages, one of the top London toy and model shops in the 30s. It's a very beautiful sleek hull shape that looks good on display or sailing. Probably cheaper to operate out of the water and probably less frustrating. Many of these yachts were raced (before radio control). Perhaps these boys are practicing for a competition at Grenadier Pond. People say they'd rather be sailing but it isn't always relaxing. Summed up perfectly in this game, I've got 2 versions of the same game. Boating in Contrary Winds and then a version which makes sailing sound even more enjoyable: Sailing in Contrary Winds and Cross Currents. Wonderful, you cast the dice, your boat lands on a square, the wind is blowing in different directions on different, sometimes adjacent squares, and you are sent off in whatever direction the arrow points. Often with no relationship to your destination. You have to overcome the whims of chance and the contrariness of winds to try to get anywhere. I think I'll have another club sandwich--now there's a subject you can sink your teeth into.